Brandon Ingram has been on a tear lately. Laker fans have been patient, hoping he would develop quickly and become a dominant scorer. Only recently, he’s starting to realize that ability. Through the month of January, he’s been averaging season highs of 19.1 points, 6 rebounds, and 4.1 assists in LeBron James’ absence. Theoretically, when the star player of a team is out with injury, you would expected for shooting percentages to drop. This hasn’t happened for Brandon Ingram. In fact, his shooting percentages jumped. While a 16 of 20 game from the field against the 76ers would have skewed the shooting sample by itself greatly, his efficient scoring has trended upward for a month. He shot above 57 percent from the field in the past 5 of his 6 games. In 9 of his past 12 games, he shot above 54.5 percent. Maybe it is a hot streak, just some lucky bounces going his way. But the overall season trend for shooting is good, with improvement from the field in each month of the season. Some would think he maintained the same true shooting (56 percent) with more 3-point shooting and finishes at the hoop. He didn’t really change his game too much. Instead he stuck to what he does most comfortably, operating from mid-range and finishing at the rim. @HoopInDetail noted an adjustment to his midrange game. His shot chart for the season shows his hot spots. Brandon Ingram has actually stuck to most of the same shot types compared to the beginning of the season. He is still operating from the mid-range area on pick-and-roll. He still gets high frequency on isolation and post up shot types. These three shot types: pick-and-roll, post up, and isolation, account for over 50 percent of his total field goal attempts. It is a good way to keep him engaged with scoring without relying on spot up shooting and off screen, where Synergy lists him as below average at .808 PPP and .811 PPP respectively. While this isn’t the most ideal shot chart in terms of what makes the most points per possession, here’s one player that showed similar hot spots last season. It’s notable that there’s a player with a strong mid-range game, who just recently expanded on his range in terms of volume and efficiency. 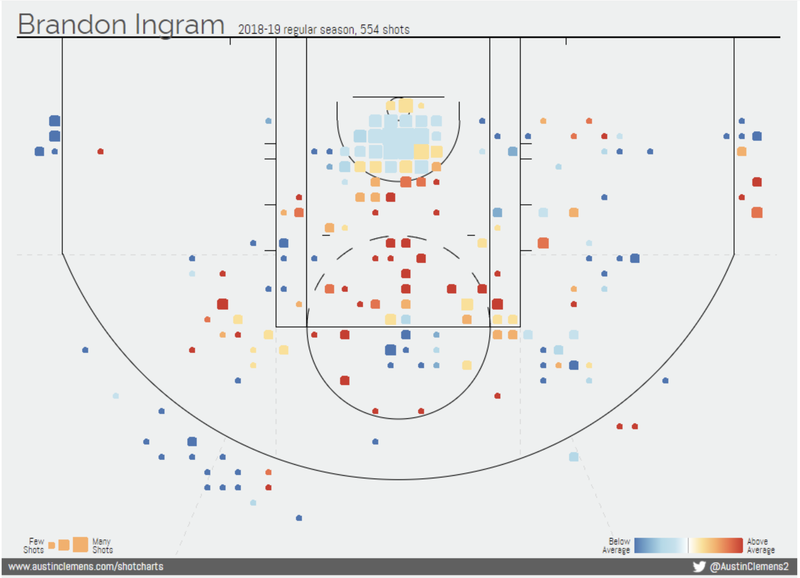 It may give an indication on Ingram’s upside with 3-point shooting down the line. In fact, Brandon Ingram is shooting 39 percent in the same mid-range area as highlighted under T.J. Warren’s shot chart from last season. 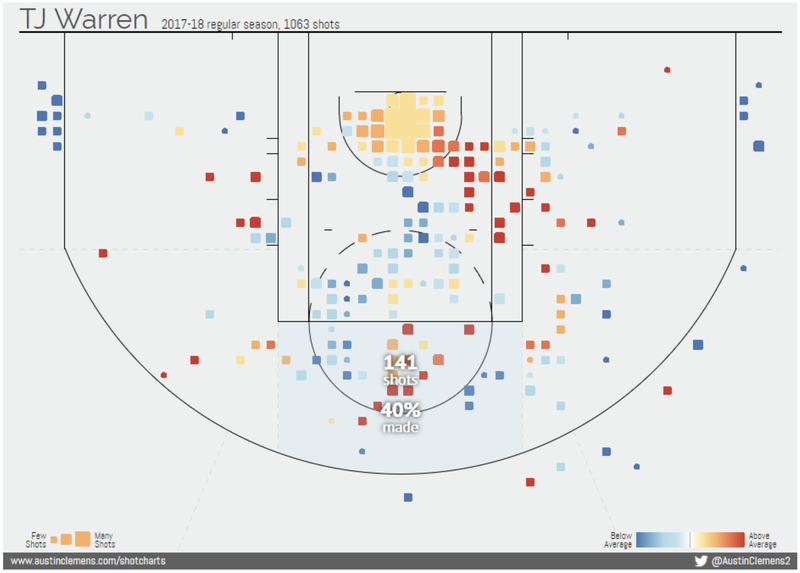 This year, Warren has been a 42.8 percent 3-point shooter on 4.2 attempts per game, a big jump from his high 20 percent shooting on roughly 1.4 attempts for the previous three seasons. Statistically, Warren is likely to regress. But if Ingram can see even a modicum of this type of improvement, it will be a good start. Considering Brandon Ingram’s tremendous pick-and-roll usage (29.1 percent via Synergy), developing a 3-point shot behind the screen would be a tremendous improvement to his shot diversity. All players progress differently, but it’s not the first time that Brandon Ingram had something click for him by midseason. During his rookie year, he discovered his ability to finish in the paint. During his second year in the league, he discovered his ability to be an initiator. Now, he is starting to understand who he is as a scorer. We often think that players can quickly adapt, that they can immediate change their shot variation, and that’s the key to becoming more effective scorers in the league. We forget that they are people too. Not only are they trying to find themselves as young adults, but they’re also trying to find their talents at this level. Something recently clicked for Brandon and it’s a positive trend, considering he isn’t leaning on star power to prove himself. Over the past two months, he’s hovering right at league average true shooting, at 56 percent. As long as he stays true to himself and his talent, he can always come back to his strengths as a player. It gives a player a foundation to build upon. The mid-range game is his.